Shortly after we moved to Arizona we decided we had to have The Icon of the Desert Southwest - a Giant Saguaro cactus - on our property. We bought one that was just shy of 8 feet tall, and had it planted in December of 2006. The planting process was very interesting. Saguaros of this size weight hundreds of pounds, so a special truck delivered it in a horizontal position. The truck tilted upwards to position it nearly vertical, and it was lowered into its hole. The Saguaro was wrapped in thick carpet at the points where the truck contacted the plant - both to protect the plant and the workers. Amazingly, the cactus had virtually no roots. They placed it in the hole and packed dirt around it. I'm sure I was like most Saguaro purchasers - skeptical that a plant with no roots that is 8 feet tall could withstand a breeze, but withstand it did. Apparently they are so heavy and have a nicely center of gravity that they can stand quite well until new roots grow. Saguaros are amazing plants, growing to huge heights (some to over 50 feet), in an inhospitable climate, and produce millions of seeds. Some individuals live over 150 years! But one of the overlooked but amazing things about the Saguaro is its thorns (spines). They grow in clumps, called aureoles, and are amazingly sturdy and rigid. In fact, after the Saguaro was planted, a few of the aureoles had fallen off. I made the mistake of stepping on one in my running shoes, and it pierced right through the sole and into my foot! As for our Saguaro, it is now about 11 feet tall and presumably has grown a massive root system. Also, it produced flowers last year for the first time (indicating it is about 35 years old. Unfortunately, the flat lands we live in are relatively devoid of Saguaros, and thus, Saguaro pollinators. Last year's crop of 7 or 8 flowers didn't get pollinated - here's hoping to this year! Saguaros are amazing wildlife plants in Arizona. Gila Woodpeckers excavate nesting cavities, which are in turn used by Elf Owls and other birds in subsequent years. 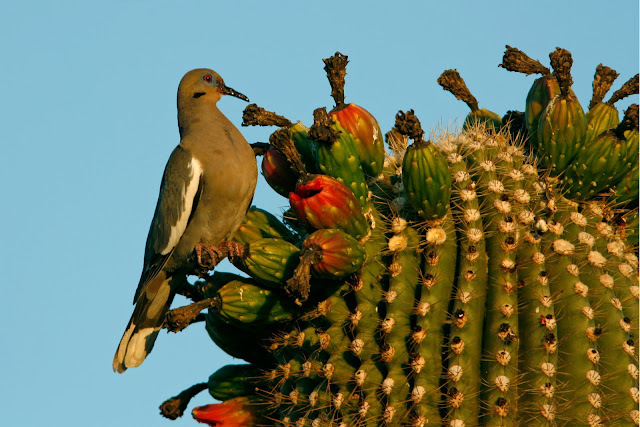 Bats and other pollinators seek out the flowers, and many birds nest in the joints, including Cactus Wren and Verdins. Ripe fruit are devoured by White Winged Doves and others. That is a very impressive shot. Makes me not want to back into one of those. This is a photo to be proud of. What an amazing plant. Great shot. Happy MM. this is like a warrior. i use to know someone who kept a plant like this near his front door to keep watch at night. wonderful photo. I lived in Tucson for over a decade, and I find them so darned fascinating. And the blossoms are simply gorgeous. Looks like it would hurt you for sure. An amazing macro. 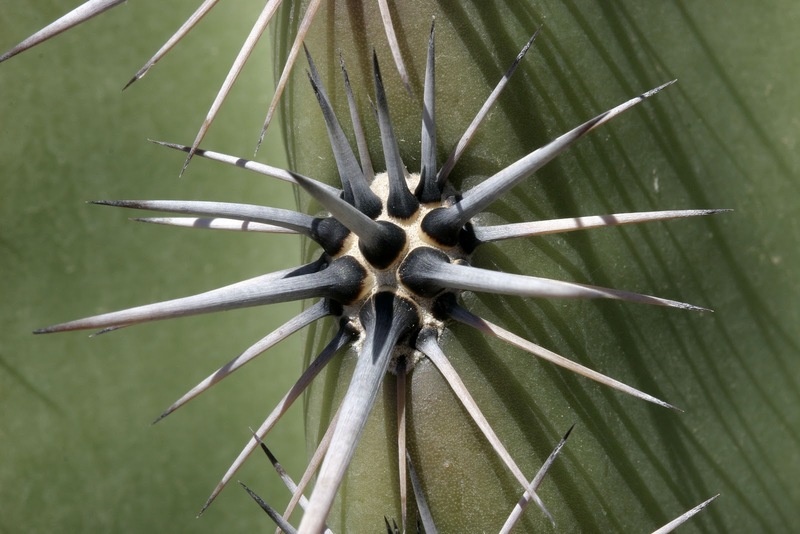 Great details of those spines - they do look very sharp! Oooo, great shot! Such detail! OUCH!